Last week we familiarized ourselves with the two main styles of punch presses (C-Frame and Straight Side), so now we want to touch on some of the key interior parts of a punch press. 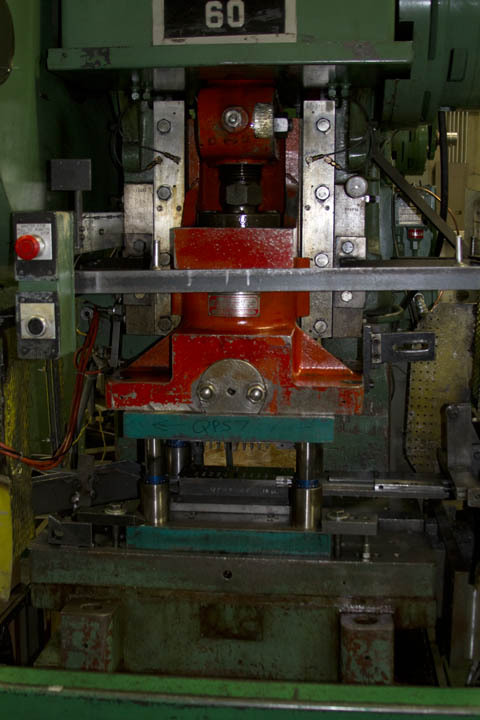 We’ll focus on the main working pieces that are most commonly found with mechanical presses. The flywheel is highlighted on the side of this straight-side punch press. The flywheel is what generates energy to the crankshaft that runs the cycles of the punch press. Highlighted here is the mechanical flywheel. 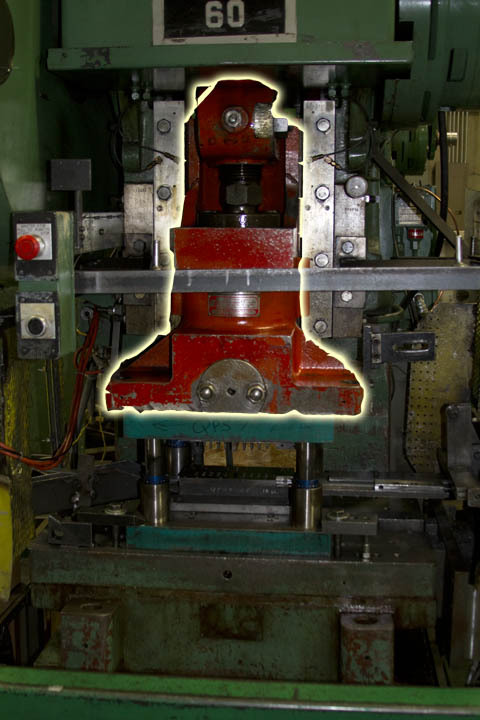 this area is critical for the operating of a mechanical punch press. Belts are attached to the lower and upper sections of the flywheel to connect the motor to the crankshaft. The yellow cage is a non-operating, yet critical component of the flywheel as well. 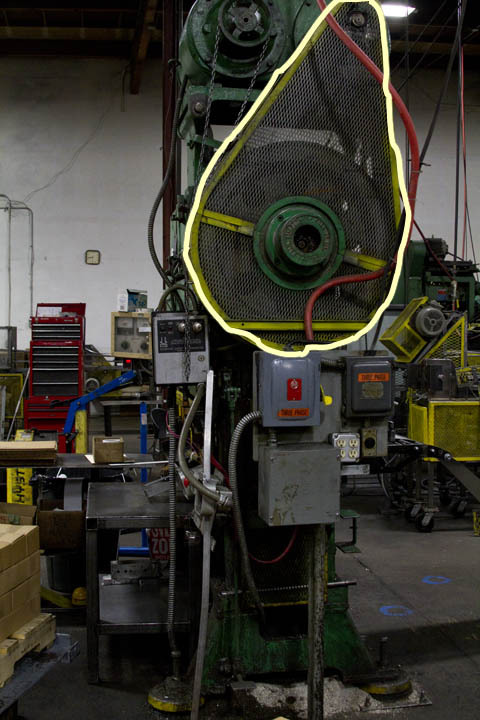 Since the motor is running the flywheel at relatively high speeds, it’s important, and is the law, to keep the moving parts covered to keep employees safe. This is the operating area of a C-Frame punch press. A die is positioned in between the ram and the bolster plate. Above we have a picture of a general operating area of a punch press. A die is installed and ready to be run in this picture. Both the ram and the bolster plate are on display here. These two parts are key to any punch press operating correctly. Here the bolster plate is highlighted. The bolster plate is a solid shelf where the die will sit and be secured to on the bottom section of the die. In this picture, the bolster plate is highlighted. The bolster plate is important because it is where the die is placed and secured on. It is absolutely crucial that the bolster plate be a flat surface. Insuring that there is no left over scrap or any debris on the bolster plate before installing a die is very important. If there was any mis-alignment on the bolster plate, the die could run crookedly and potentially break and damage the punch press. In this picture, the ram is highlighted from inside of a C-Frame punch press. The ram is the moving part that transfers the tonnage generated by the press down to the material. With a die attached, this creates different products. The ram is rather self explanatory, as it is the moving part that rams the punches of the die into the material. The die is also attached to the ram to insure that the die is running as smoothly as possible. 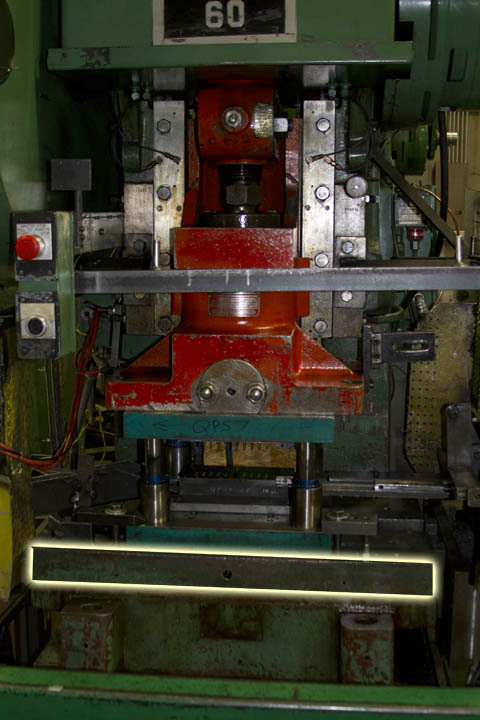 During the set up of a die, the ram is manually adjusted to the correct height. If the ram is set too high, the die doesn’t cycle through properly, and does not perform its functions correctly. If the ram is set too low, the die can bottom out and become stuck, creating heavily damaged dies, a stop in production, and many headaches. These three pieces are what make a mechanical punch press go. While there are a lot of pieces that make everything run, if the ram, bolster plate, or flywheel are malfunctioning a punch press is not going to run efficiently, if at all. Next week we’ll take a look at the differences between mechanical and hydraulic punch presses. This entry was posted in Metal Stamping on March 5, 2014 by johnatmetalproducts.